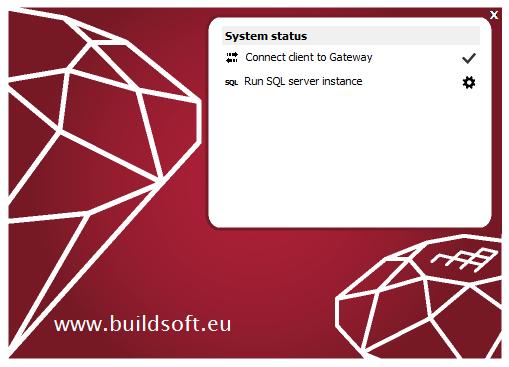 Error message on starting Diamonds/PowerConnect: Run SQL server instance. Additionally, you can see: GetNumberOfMaterials or GetNumberOfVariableSections. Cause: the SQL instance is not running. Open Task Manager > Click on ‘More details’ at the bottom to see the full version of the Task Manager > tab page ‘Services’. Find the service ‘SQL Server (SQLEXPRESS14 or SQLEXPRESS14BS)’ > right mouse button > ‘Start’. 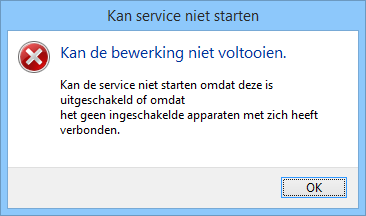 [NL]: Kan de service niet starten omdat deze is uitgeschakeld of omdat het geen ingeschakelde apparaten met zich heeft verbonden. Find the service ‘SQL Server (SQLEXPRESS14 or SQLEXPRESS14BS)’ > right mouse button > ‘Properties’. Set the Start-up type to ‘Automatic’. Click ‘OK’ to close the window. You still see the error ‘Run SQL database. Try resetting the Gateway preferences. You see the error ‘Connect Gateway to Gateway Server‘. For all other problems, install Teamviewer and give us a call (+3292526628). 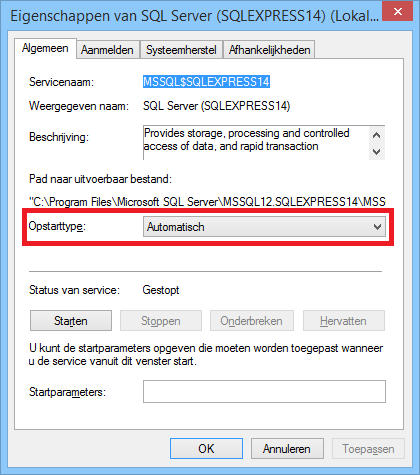 In the Task manager > tab page ‘Services’ (= the first printscreen), SQL Server is referred to as ‘MSSQL§SQLEXPRESS14’. In the window ‘Services’ (= the second print screen) it’s referred to as ‘SQL Server (SQL EXPRESS14)’. 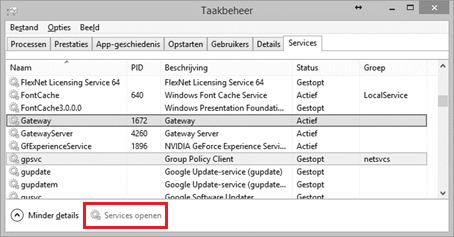 In the Task manager > tab page ‘Services’, you’ll also find a service called SQL Agent (SQLAgent§SQLEXPRESS14 or SQLAgent§SQLEXPRESS14BS). These services are not used by BuildSoft software and may not be confused with ‘MSSQL§SQLEXPRESS14’ or ‘MSSQL§SQLEXPRESS14BS’.